Selling Out for Sponsored Content? Publishers of sponsored content are playing fast and loose with credibility, the ‘unique value proposition’ journalism has to offer. The Atlantic is one news site, of many, that now features sponsored content. Image courtesy of The Atlantic. For generations of journalists, the separation of “church and state” represented an enduring ideal: The business side of a news organization would not interfere with the independence and integrity of its reportage. Like most ideals, this existed as much in theory as in practice, as evidenced by the product and brand-centric content populating the pages of Lucky, Maxim and InStyle. Yet the basic layout of more reputable newspapers and magazines—with ads on one side and editorial on the other—at least seemed to mirror this ambition of walling off influence and, perhaps more critically, suggested as much to readers. For advertisers and their corporate clients, however, it was never a satisfying arrangement. “Marketers haven’t ever wanted to underwrite the content industry,” admitted Rishad Tobaccowala, chief strategy and innovation officer at a digital firm, in The Daily You. “They’ve been forced.” The increasing creep of sponsored content away from the margins of media and into the stories themselves suggests that marketers might no longer be forced to stay to the side after cutting the checks. And the resulting blur of that “church and state” offers a Faustian bargain to the news industry: What could save it from financial woes might also destroy some of its noblest principles—delivering content unencumbered by those subsidizing the enterprise and gaining readers’ trust through that appearance of impartiality. BuzzFeed is usually Exhibit A in the case for (or against) brand-backed content, but one can argue that it’s an innocuous arena for experimenting with publishing norms. (Does the fact that Dunkin’ Donuts assembled this gallery of slapstick GIFs, for example, really compromise the “integrity” of the site?) The Huffington Post has similarly advanced its own sponsored partnerships, but it, too, has long been a noisy bazaar of link-baited listicles and thinly veiled promotional copy. As these sites have matured, though, they’ve pursued even more substantive news coverage, especially in politics. And the results of their sponsorship experimentation could well set the industry standard for other publications online. That’s disconcerting, when the placement and style of advertorial content at those sites seems to intermingle freely with the more “legitimate” reporting there. Indeed, the true ambition—and real threat—of brand integration begins to emerge when you study the sponsored posts at, say, Gawker and note how, tonally and aesthetically, the ad message is supposed to blend in, indistinguishably, with the neighboring snark. The industry term for this, “native advertising,” reveals its aspirations to embed PR material in adjacent spaces we’ve come to expect editorial autonomy. More venerable venues have been getting in on the act. 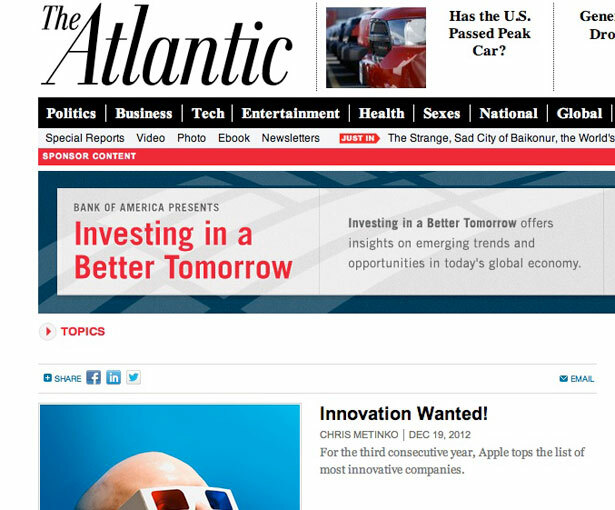 The Atlantic hosts such sponsored content in above-the-fold, headline links; The Washington Post’s BrandConnect program delivers readers to marketers in what it calls “a trusted environment” (i.e., front-page articles); and Forbes’s BrandVoice “allows marketers to connect directly with the Forbes audience by enabling them to create content—and participate in the conversation—on the Forbes digital publishing platform,” hosting blogs all their own. Even The New York Times is reportedly mulling over BuzzFeed-style sponsored integration—looking at “ways you can use journalistic storytelling techniques” to “present a narrative” for corporate clients. It’s not hard to see why publishing might be headed in this direction. Thanks to changing technologies and plummeting advertising revenues—with newspapers losing $20 billion and magazine money similarly sliding—journalism has suffered through a decade-long swoon. On the other side, laughable click-through rates for banner ads means marketers are eagerly exploring other alternatives to engage eyeballs. Thus, these shotgun marriages we’ve been seeing, journalistically, are part of a larger trend toward branded content. As traditional ad venues no longer suffice, sponsors need a vessel. As traditional distribution platforms no longer survive, culture creators need a patron. This explains why BMW would release its own online film series (flashy demo); why Wrigley’s would finance a Chris Brown pop hit (gum jingle chorus line); and why the US Army would develop a first-person-shooter computer game (recruiting tool). Vice has been effectively playing this game as well—the provocative free-magazine-turned-multimedia-lifestyle empire offers advertisers co-creative participation and brand alignment through single videos, entire series, and websites. Such guerrilla advertising—now reportedly 12 percent of marketers’ budgets and growing—simply sees journalism as yet another form of “content” it might take ownership of. We’ve tolerated—if not welcomed—our brand overlords in these other cultural spaces like film, music, and games, because it was just artistic creativity, rather than the foundations of democracy, that was at stake. “Objectivity doesn’t matter,” one “brand journalism” consultant argued in a recent piece on the spread of digital agency “newsrooms” that promote clients through the kind of “thought leadership” pieces popping up at The Atlantic. Coca-Cola recently reimagined its company website as more of an “online magazine” for news and storytelling rather than conventional promotion, hiring journalists to brainstorm content like any other editorial staff. Similarly thinking of itself as a “legitimate media company,” as Advertising Age reported, with more than a million subscribers, Kraft began charging for its quarterly, Food & Family, and Best Buy launched its own web-magazine venture “meant to be journalistic in nature” and “a nonbiased place” for information. “When they hear ‘brand entertainment,’ that’s what [journalists] think: You’re trying to blur the line and confuse the audience and no doubt, some who do that are,” Scott Donaton told me. As a former Advertising Age editor and CEO of a branded content company, Donaton has been both a prophet for and profiteer of these kinds of “Madison & Vine” partnerships, his shorthand for the convergence of advertising and entertainment (and the name of his book). The clarity of that caveat is, of course, in the eye of the beholder. Following a kerfuffle over some Scientology propaganda lurking as “native” advertorial, The Atlantic revamped its policy on branded articles earlier this year. Curiously, little fuss had been made about, say, Bank of America–financed stories there that predated the Scientology flap, though they, too, were meant to be indistinguishable from the style and substance of genuine editorial. A quick quiz—which, of the following, are “real” headlines and which are sponsored? “Cloud Computing Your Way to Wellness,” “The Census Bureau Gets Its Groove Back,” “Work on Mars Means Jobs on Earth,” or “Will There Be Buyers in the Gamification Game?” Trick question: they’re all sponsored! Readers might surely recognize and recoil from content they can obviously identify as vested, but they might be less equipped to pinpoint some of these more subtly camouflaged think pieces. Like other news organizations, The Atlantic now tags such stories with an all-caps “Sponsored Content” disclaimer—the editorial equivalent of handling such material with Hazmat gloves. Given a choice, the marketers now filling out those digital advertising “newsrooms” would surely prefer not to be relegated to such second-class status. And depending on how desperate news revenues get, they might soon demand (and receive) better treatment in that regard. He who pays the piper can increasingly—and more aggressively—be calling the tune. To be certain, journalism only and ever existed as pure in the textbooks, but it’s advantageous for both publishers and advertisers to delineate clear boundaries. If advertorial content snuffs out audience interest because of betrayal or blandness, both parties are out of luck. Advertisers can always just take their money and underwrite content elsewhere—heck, if watching paint dry or grass grow drew eyeballs, they’d happily fund it. A newspaper or magazine does not have the same luxury. It’s a dangerous game when a news organization plays fast and loose with its credibility, for credibility is, ultimately, the most important “unique selling proposition” that journalism has to offer (to borrow a phrase marketers should understand). It is precisely that authenticity and legitimacy which marketers covet and are paying to mimic when they creep into these editorial spaces. To sell that out is to sell out something that cannot be restocked quite so easily. Michael SerazioMichael Serazio is an assistant professor of communication at Fairfield University and the author of Your Ad Here: The Cool Sell of Guerrilla Marketing.